With the right mix of research and entrepreneurial activities, Chitkara Business School (CBS) is an epitome of new-age management institutes in the country. The University has nine advance research centres, which focus on applied research for better healthcare, quality education and a safer society. "Our Office of Patent Facilitation Licensing and Consultancy (OPFLC) has benefited 200+ inventors, filed 100+ plus patents. Our DST and MSME recognized innovation incubator has incubated 20+ companies and is now growing to become the biggest in the north India. We have incentivized the research-ecosystem in our university at all levels of students and faculty," claims Dr. Madhu Chitkara, Vice Chancellor of Chitkara University. It says, innovation comes within when a suitable environment is built around and that is what exactly CBS has been doing since its establishment in 2006. At CBS, students actively participate in research, patent their models/products, run enterprises, visit industries across the globe and at the end, many join best of brands through campus placements. "Innovation cannot be just taught in the classroom, but at the same time it can be practiced and encouraged through right kind of environment," opines Dr. Madhu. At CBS, students actively participate in research, patent their models/products, run enterprises, visit industries across the globe and at the end, many join best of brands through campus placements. There are many activities in the CBS curriculum, which are directly linked to management applications. One example is ChitkaraMandi wherein students sell products of NGOs at a real market place. With the priority for entrepreneurship, the institute offers various opportunities to the students. Other activities include Retail Project work with Big Bazaar every year for SS6D (Sab Se Sasta 6 Din) retail activity in the store. Reliance Smart Investor Program undertakes Smart Investor Program in association with Reliance Mutual Funds and the Market Exposure Program at Mumbai provides students with an opportunity to visit several financial institutions, marketing firms and so on for first hand exposure. The incubation centre is also active with more than 12 companies successfully running under it. CBS is, however, not just a place of opportunities for budding entrepreneurs. They rightly direct the job seekers. More than 74 companies offered job opportunities to 160 MBA students of the last batch. The brands include Deloitte, EClerx, Evalueserve, Mondelez, Nestle, Kellogg's, ITC, S&P, Wipro, BSE, Safexpress, Rivigo, Fortis, Evalueserve, Morgan Stanley, ICICI Securities, Allstates, Ocwen and many more. "CBS provided me a platform due to which today I find myself a more confident person personally as well as professionally. At CBS, I learnt how to take decisions under all situations, which is something that will definitely help me in the future. Study-wise, I consider Chitkara Business School as an institution that gives its students a practical outlook into the actual workings of an organization," says Apoorva Saini, alumnus of CBS who now works at Citibank. "We feel that it is academic environment that makes the difference for the graduates of CBS. We do our best to create an academic environment for getting best of results," says Dr. Madhu. The institute's programs are articulated based on latest requirements of industry. With a focus on employability, the college offers MBA in Marketing, Finance & Banking, Healthcare Management with Fortis Hospitals, HRM with Manpower Group, Supply Chain Management & Logistics with Safexpress, Financial Markets Practice with BSE, Sales & Retail Marketing and Pharmaceutical Management. "Our tie-ups and relations with industry are not limited to 'MoU Document'. It goes beyond that," adds Dr. Madhu. The strong international partnerships with 70 Universities across the globe open the opportunities for students to take best of global education. "I spent six months of my semester exchange in Netherlands through Chitkara University during my MBA program. It helped me getting a global perspective of management education. It is because of that I could get through Management Trainee Profile in Utrade," says Ashween Dara, MBA (HR) Management Trainee, UTrade. The countries with the partner universities are USA, Germany, Spain, Netherlands, Japan, Russia, Singapore, Australia, New Zealand and so on. Ultimately, the international collaborations, student-faculty exchange and the researches influence the teaching-learning process in a stronger way. "Now, we look forward to more industry linked programs catering to the skill requirements of the market. Focusing on research and entrepreneurship,we intend to develop more startups and we also aim to contribute in building a knowledge society," concludes Dr. Madhu. 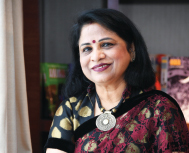 She is one of the co-founders of Chitkara Educational Trust, an organization of great repute and distinction. An eminent academician, an innovative entrepreneur, she has articulated, designed the road map for the Trust & has actively contributed to its tremendous growth and recognition in all these years and is spreading light of education in the life of tens of thousands of people.